Sometimes you can’t wait until you get to the party to show off your costume. Partiers took to Instagram over the weekend to flex their costumes, and we found some of the best pre-party mirror pics. Where’s Waldo? In the bathroom. Impressive skull makeup by @agnesegaggero. An extra terrestrial success by @oh_she_nailed_it. @gettheknack poses as Poison Ivy. Facial wounds photograph well on @lulisway. @nicholassima89 snaps a pic dressed as Immortan Joe from Mad Max: Fury Road. @azerothprincess serves up a brunette Britney. @jessartin is Nicki Minaj. Pretty on fleek. Even the undead need to check the mirror before they leave to eat your brains. 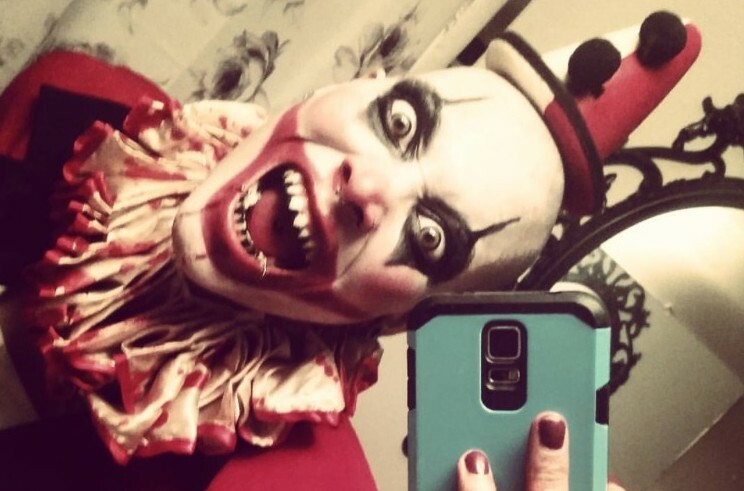 @booboo_kittiefuck is the evil clown hiding in your bathroom. A penguin onesie by @mikeiladee. Clark Kent exposing his identity in a mirror pic. Scream! Ghost Bride and Ghost Face. Lady Gaga is one of the most iconic artists of this generation and tonight she added television star to her resumé. American Horror Story: Hotel premiered tonight on FX.